Nora Moelle has long been known for producing series of immaculately thrown bowls and beakers, whether in tawny salt glaze or in luminous white porcelain. Inspired by archaeological finds of Stone Age pottery near her hometown of Trento, where unusually square-lipped bowls and beakers challenged notions of conventional symmetrical stoneware, Moelle began to explore the processes and implications of broken symmetry in ceramic forms. This exhibition charts six years of speculative inquiry, the basis for Moelle’s PhD thesis. Nora’s investigations took her out into the curved space of Einstein’s theory of relativity and into the rarefied realms of non-Euclidean geometry, superseding the static geometry of the ancients, the fixed cosmos, the laws of nature long thought immutable. She followed the links between mathematical theory and the breakthrough in modern art early in the twentieth century, but also examined the practice of eccentric potters past and present. IMAGE © Nora Moelle, Installation of vessels in spiral from decreasing height (from the Square Mouthed Vessels series), southern ice porcelain, unglazed, etched, various height. Photograph by Allan Chawner. Expanding on a long and intensive study of humanity’s relationship with the Australian landscape, Nicole Chaffey has turned her investigations inward, exploring concepts of contemporary Aboriginality, memorial and emotional ties to the country of her forbears, the Biripi country of the Manning River region and the intricate familial relationships that keep it all connected. Traditional paint medium and paper surfaces evoke a deep history of attachment to place, and skyward looking imagery is a reminder of the transience and evolutionary nature of identity. north: remembering country is the result of Chaffey’s MPhil candidature at the University of Newcastle. Luz Corporea is the result of Pablo Tapia’s long research into the transformation of personal language of feelings into a powerful universal form, where light and memories find substance and activity in the physicality of paint. Both his experiences of mixed culture and political dictatorship in his native country, Chile, and his ongoing visual problems, influence this artistic vision: seeing life at large as a complex, magical, and sometimes uneasy experience. This PhD exhibition Julianne Tilse's quest to better understand the dynamic and changing landscape of the Hunter River Estuary in New South Wales, Australia. Fresh perceptions of the river emerge with interdisciplinary research and practical encounters of being in and moving through this specific riparian landscape – experienced from within and upon the river in a rowing boat, across times and tides. 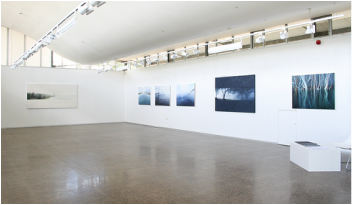 The exhibition offers a synchronisation of art, science and philosophy in works of art that echo a deeply felt connection to the river – a living enquiry – aiming to expand perceptiveness and enliven a more astute sensitivity for the Hunter River. Thomas James Rodoni’s glass plate negatives were unearthed from under a house in Speers Point by Rodoni’s son Bill, and given to Cultural Collections at the University of Newcastle in 2014 – one hundred years after the start of WW1. These glass negatives were lost treasures that documented the first military conflict of the First War, the fall of German New Guinea, an engagement that witnessed the first casualties of WW1. This extremely rare collection is by one of the few non-official photographers during the war and this is the first time these images will be on display, commemorating 100 years of ANZAC. Drawing inspiration from the great modern architectural icons of Manhattan, New York, Grant Vercoe's paintings aim to visually articulate the experience of the scale of this metropolis. His research explores recent responses to the architecture of Modernism, Neo-Modernism and post-modernist Deconstructive architecture. This exhibition of paintings is drawn from a body of photographic images captured on a research trip to New York in June 2011. The materials Louise McAlpine uses to create installations are mainly of a textile nature. Her visual and haptic senses combine to create a hand crafted oeuvre, but her sense of touch is the ‘curator’ in her studio. She constantly forces her touch sense to dictate aesthetically in the decision making process. In today’s digitally dominated environment, it is difficult to not spend at least a few hours in touch with a digital interface. Significantly, it is at this point of contact with a digital device that the user is only in touch with one kind of tactile experience. These are smooth flat surfaces which are globally generic in shape, size and form. It is in this space that McAlpine chooses to initiate her Hapticivism: an interruption of haptic action. IMAGE © Louise McAlpine, studio process for installation, 2015. An exhibition exploring the history of the Aboriginal people of the Newcastle area, tracing their stories, culture and their intrinsic relationship with the land. Significant sites, traditional practices and sharing stories, will be brought into focus as we celebrate the University and its community in 2015, and acknowledge the custodians of the land. Original artifacts, flora and fauna will accompany early images by European artists such as Joseph Lycett, and will set the scene as the exhibition follows the history and development of Newcastle from an Aboriginal perspective. The exhibition, held in association with the University of Newcastle Wollotuka Institute, will also launch Professor John Maynard’s new book Callaghan, The University of Newcastle, Whose traditional land? The University holds many treasures that have been donated for the benefit of our students, staff and community, collected and maintained for sharing with future generations. Since the University achieved autonomy in 1965, members of the community and graduates have shown their support in a variety of ways, including the gifting of cultural items and donations that enable us to expand our cultural collections. This exhibition acknowledges the generosity of those who give to enrich the lives of others, and will profile 50 such items that captivate and enhance our working and learning environment. Rare books and butterfly collections, precious musical instruments and Pacific ornaments, will sit alongside the artwork of some of Australia’s most acclaimed artists. IMAGE: Margaret Olley, After rain, looking towards Stockton, 1970, oil on board, 52.5 x 90cm. Donated by the artist to the University Art Collection. © courtesy the Margaret Olley Estate and Philip Bacon. Lezlie Tilley’s art practice is deeply entwined with poetry: poetry in its written literary form, as well as the kind of poetry found in abstract ideas or the expression of material structure. Tilley’s works in this exhibition explore the possibilities created by taking a fundamental form or idea and extrapolating it infinitely, reducing it to positive and negative shapes, or employing repetition with small and intricate variations in colour, size, and stroke. Tilley searches for the essence of form, revealing the simple and inherent beauty in the minutiae of lines, patterns, and the seemingly random arrangement of individual marks on a surface. IMAGE: © Lezlie Tilley, installation of Halloween series: Tilley's response to the 28-stanza poem written in 1785 by Scottish poet and lyricist, Robert Burns. This body of work is about Nathalie's aunt who suffers from Dementia. Her aunt doesn’t speak French anymore and from the new language she has created, Nathalie developed a set of poems based on our surrealistic conversation. They translate her emotion into written sounds and rhythms. The geometrical drawings in this exhibition are a representation of the space we live in but with illusions and distortions, thereby translating the world of memory loss. She also wanted to remember the everyday objects that were part of her aunt's life, resulting in rubbings on paper such as the armchair she used to sit on and other pieces of furniture; a tactile and intimate photography of her objects. Since 2003, the High Performing Students Program has been giving exceptional high school students the opportunity to get a ‘taste’ of university life while still at school. While the program is delivered at Merewether High School, it is open to students from other local schools and aims to keep our best and brightest in the region. This is the second year of the High Achievers program in Fine Arts. However, it is the first time that the University of Newcastle’s School of Creative Arts has joined with the School of Education to provide a unique focus. The students have been encouraged to explore concepts from science through visual arts. This is an exciting opportunity to further investigate how thinking in the fine arts can inform other ways of understanding knowledge in the world. In this exhibition the facades of ten famous houses – five Modern and five Post-Modern – are revisited using alternative representational strategies. Each new strategy seeks to uncover or reveal the underlying tensions or elisions in the work, using new colours, textures and images to question each architect’s approach. Through the use of both serious and ironic representational approaches, these ten famous buildings are reimagined in a more political, cultural and subversive manner. ‘Kaleidoscope of Indian Cities’ - In India there are multiple interconnected lives that can be observed at any given time in its myriad cities. These lives, through their intersections and juxtaposition, generate multiple images that may seem contrary. In the face of daunting complexity and palimpsest of histories we have sought to steer away from constructing compelling classifications or attempts to fix the essential character of Indian Cities. This exhibition takes a nonlinear approach and presents Indian cities with their irreducible differences that need to be understood in their own terms, but still provide invisible connections whether they are cultural, aesthetic or existential, as observed and experienced by four individuals. In Indian classical music a raga is a framework for composing music, the various ragas identified by their structure. Each raga, through its composition and recital, seeks to create a mood or evoke a rasa/flavour/emotional response in the listener/viewer. Neel, the colour blue, is traditionally extracted from the Indigo plant: it is a pigment that has physicality, but its materiality is spiritual, economic and political. Matter and spirit, labour and agency, are linked in different ways in shaping the contemporary Indian environment. Neel Raga explores Indian aesthetics and colour in the Indian built environment through photographic images of a courtyard house in the city of Jodhpur, within the Indian state of Rajasthan. Through the concept of raga and its associated concept rasa it records the evocation of atmospheres during night and day. Neel is indexical of the temporal and cultural forces at work in Indian society that reflects and refracts transmutation in its symbolical meaning. IMAGE: © MA Collaborative, Untitled, 2013, digital and print. This twenty-year survey of Chinese born artist Fan Dongwang explores the shifting borders of Asian and Australian cultures through a series of dynamic, large format paintings that use colour and motif to shift cultural perceptions in art. The works exhibit a refined attention to detail while exploring the global experience of shifting boundaries in this Asian century. A casual read of any of the University’s Seahorse alumni magazines cannot fail to impress on the reader the scope and success of our alumni in their chosen fields. Our creative alumni are no exception and this exhibition at the University Gallery profiles the stellar careers of some of our finest graduates who make a difference to the way we see the world through art and creative practice. Many of our past students have earned national and international reputations for their wide-ranging, innovative and cross-disciplinary approaches to fine arts, photography, and other creative fields, while maintaining strong links to the university and Newcastle community. In recognition of the importance of creativity in our cultural landscape, and in celebration of the university’s 50th anniversary, the works of selected alumni will highlight the broad scope of their ongoing investigations and achievements. IMAGE: © Shan Turner-Carroll, Primal Faith #8, from the Primal Faith series 2011, digital print on photographic paper, 59 x 39.5cm. liminal /ˈlimənl/ adjective technical1. Relating to a transitional or initial stage of a process.2. Occupying a position at, or on both sides of, a boundary or threshold. Showing across two locations at Callaghan campus, the University Gallery will feature the work of six BFA Honours students presenting their final works for examination: Libby Eckersley, Shelagh Lummis, Louisa Magrics, Kalinda Nelson-Boyd, Shandele Pascoe, and James Rhodes. BFA Honours students showing at Watt Space Gallery, and third year graduates at the AT (Art) Building.